Epifluorescence IF image using MuERVL-Gag Polyclonal Antibody in mouse preimplantation embryos from the 1 cell - 4 cell stages. 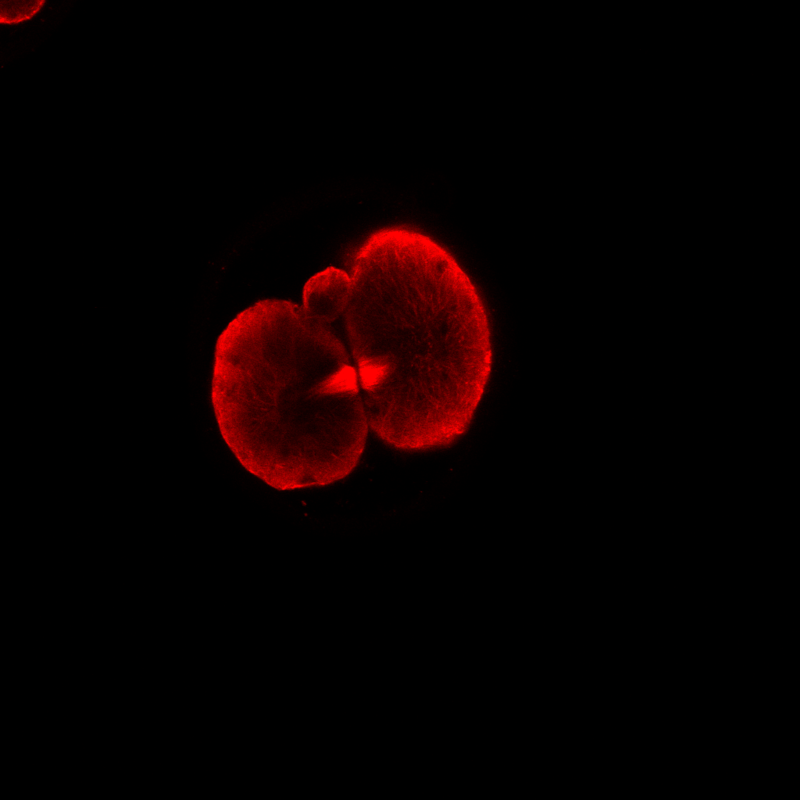 ICC staining MuERVL-Gag in mouse 3-cell stage embryo. 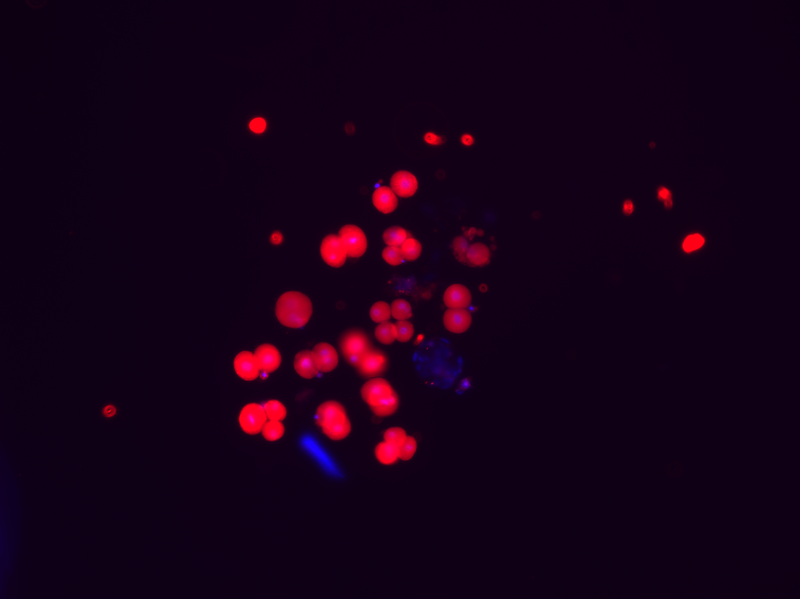 The cells were incubated overnight at 4°C with MuERVL-Gag Polyclonal Antibody at a 1/100 dilution (shown in red) and phalloidin (shown in green). Nuclear DNA was labelled with DAPI (shown in blue). When the zygotic genome is first transcribed, a large number of retrotransposons are expressed, including the endogenous retroviruses (ERVs), LINE-1 elements, and the non-autonomous SINE elements. MuERV-L/MERVL retrovirus-like particles are transiently de-repressed and produce 3% of the transcribed mRNAs at the two-cell (2C) stage. Right after the 2C stage, the expression of MERVL-retroelement is silenced. It has been found that this regulated pattern of MERVL expression overlapped with more than one hundred 2C-specific genes that have co-opted regulatory elements from these foreign retroviruses to begin their transcription. Rabbit polyclonal antibody to MuERVL-Gag. 1*TBS (pH7.4), 0.5% BSA, 40% Glycerol. Preservative: 0.05% Sodium Azide. Yang L et. al. (November 2018). KDM6A and KDM6B play contrasting roles in nuclear transfer embryos revealed by MERVL reporter system. EMBO Rep.
Lei Yang et. al. (August 2018). Fine Tuning of Histone Demethylase KDM6A/B Improves the Development of Nuclear Transfer Embryo bioRxiv. The antibody was used for IF to look at the subcellular localization of the protein. Very clean images were obtained, no complaints. Female mice, aged 4 weeks were superovulated with PSMG and HCG injections spaced 48hrs apart. preimplantation embryos were harvested 20hrs post HCG injection and in-vitro cultured in KSOM until desired developmental stage was reached. Embryos were fixed with 4% PFA supplemented with 0.3% BSA. Embryos were then treated with primary antibody at a 1:400 dilution in 0.3% BSA in PBS and incubated overnight. Embryos were then incubated with Alexa Fluor 647 or 488 secondary antibodies for 1-2hrs and then washed thoroughly in 0.3% BSA + PBS. Embryos were then treated with DAPI for 15 minutes, washed again and mounted onto slides ready for visualization. Would like to know the specific peptide sequence used to generate the antibody if that information is available.